CMH kindly provides a map of its arrivals level, showing the location of the airport’s pet relief area, but it’s a bit hard to follow. Here’s what you do: Exit the baggage claim level through the doors across from Carousel 2, then turn left and walk to the end of the sidewalk. 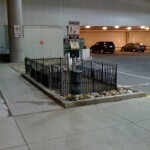 The pet relief area is a small, fenced enclosure lined in crushed stone. Poop bags and a trash can are provided, but the area was very dirty when we visited. 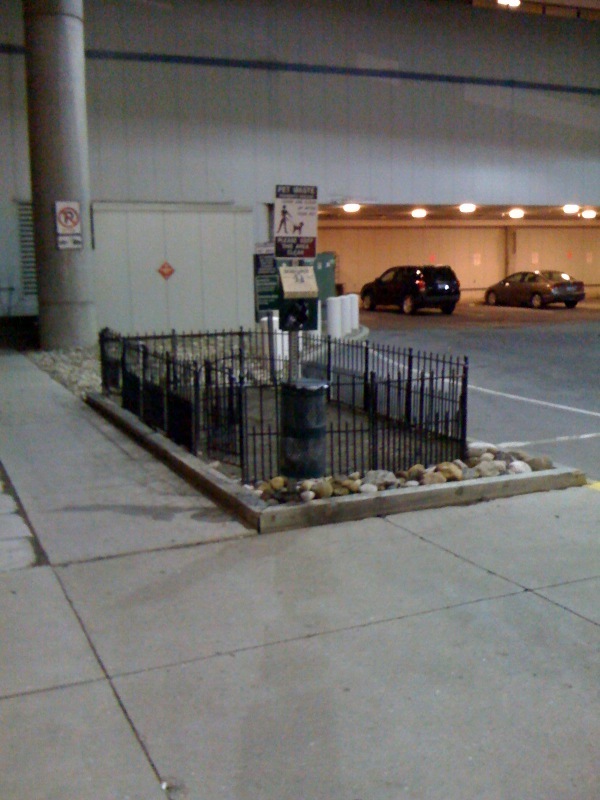 A far better choice is to cross the airport road to an area whose pillars bear the signs “Pre-arranged vehicles.” Right next to them is a big patch of grass — much cleaner and more pleasant than the official relief area, but you’ll need to carry your own poop bags. This is cool! I’ve never seen or heard of pet relief areas at airports in Canada. They may exist, I’ve just never heard of them. Is this a relatively new thing offered by US airports? It is a good idea, isn’t it? Under the Air Carrier Access Act [14 CFR Part 382, Subpart D §382.51(a)(5)], all U.S. airports were required by May 13, 2009 to have set aside or constructed pet relief areas for traveling service dogs. Those areas are also available to other traveling pets. I don’t know if Canada has a similar rule. Word has it that the Montreal and Vancouver, BC airports both have pet relief areas, but I haven’t yet visited them.